Most of us will read the title “Doctors Microwave Armpits” and immediately think that this must be related to some kind of sick delicacy for cannibalistic psychopath physicians or that Wikileaks has exposed the latest twisted torture for Guantanamo terrorist suspects. It should come as a relief however, that the practice of microwaving armpits is a medical treatment for sweaty underarms and is nothing to do with forcefully extracting information from people who look like they may have met Bin Laden, nor is it linked to a new Hannibal Lecter novel. 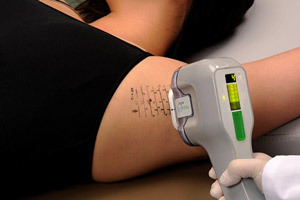 miraDry is a treatment developed by Miramar Labs Inc. which they claim will “Permanently stop underarm sweat now.” They say that all you need to give them is 1 hour and around say $3000 and they’ll end your armpit sweat patch embarrassments forever. The treatment involves a quick underarm shave, followed by a little local anaesthetic cream and then, a 30 minute per pit, underarm sweat gland zapping with a handheld microwave gun. The miraDry microwave armpit treatment which was approved by the Food and Drug Administration in 2011 was designed for those 210 million people worldwide who suffer from excessive sweaty armpits or hyperhidrosis as it’s known in medical terms. Several studies have been conducted on miraDry’s effectiveness and safety. However according to Los Angeles armpit specialist, Rafael Reisfeld, many of these were sponsored by the miraDry creator Miramar Labs and are likely to be biased in favour of the product. One study saw that 89% of patients who received the microwave armpit treatment did indeed experience success. The underarm sweating was almost totally subdued basically because the microwave energy destroys the sweat glands in the armpit. The sweat glands do not grow back thus the treatment is permanent. Along with the success of the miraDry microwave armpit treatment are some side effects which include tenderness and swelling of the armpits which can last for up to a month and see swelling as large as a tennis ball. Numbness, tingling and muscle weakness of the arm have also been reported. Some patients have also experienced a reduction in armpit hair since the treatment. This is due to the armpit microwaving destroying some of the hair follicles along with the sweat glands. Personally, I wouldn’t opt for this treatment, but for someone who suffers from buckets of sweat cascading down the sides of their body, then microwaving their armpits may be worth a $3000 doctor’s bill.